Through simple to use web-based dashboards, a business owner or marketing professional has on-demand access to key data points they wish they always had, and often did not know was possible to obtain. Wachae’s products and services were built from knowledge gained from years of hands on experience working for service related businesses seeking to “keep the phones ringing” through online and offline marketing channels. 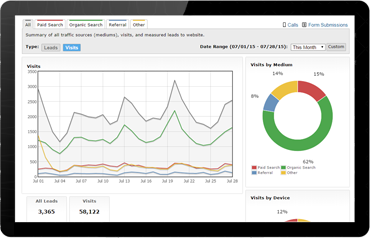 While the dashboards can help measure results from both online and offline marketing efforts, a focal point of the product is to report on and optimize search engine related lead activity which is often the most impactful online source connecting new customers to a business. Having actionable data relating to how search marketing and other marketing campaigns are performing relative to one another is critical to making educated budget decisions. Empowered with Wachae’s dashboard tools, a business can hold marketing efforts accountable for results and direct advertising dollars accordingly. Track leads and activity from online and offline marketing campaigns. Listen to calls, view form submissions and evaluate campaign performance. Adjust campaigns to increase leads and maximize your marketing budget.